The Churchill I is a British tier 5 heavy tank. The A22 prototype was built by Vauxhall Motors in the fall of 1940. The vehicle first entered mass production in the summer of 1941. Early modifications had no track fenders, a different fan, and a 3-inch howitzer in the hull. A total of 300 Churchill I tanks were manufactured. The Churchill I is by far the slowest heavy tank at Tier 5. It is a very inflexible vehicle with some very glaring weaknesses, but it does have few good traits such as high armour and an accurate gun with good penetration. The Churchill I leads to the Churchill VII, and the Churchill Gun Carrier. Highest HP pool of any tier V heavy (700 HP with second turret). Good view range, especially for a heavy tank. Armor can be somewhat tough if angled; Small 177mm strong point in upper-right hull will bounce even some tier 7 guns . 2nd highest penetration of the tier V heavies (only the VK.30 01 H ranks higher) with great accuracy and aimtime. Good turret traverse for a heavy. Majority of the frontal hull armor is only 75mm with no slope. Top turret is Flat, weak, and has no mantlet. Exposed roof is a pitiful 19mm thick (57mm guns can overmatch!). Exposed tracks get knocked out very frequently. Deplorable gun elevation and depression when using top gun. The Churchill I has a wide variety of guns available, but only two are even close to viable. The 6-pdr Mk V has a high rate-of-fire and 10 degrees of gun depression, but rather low penetration and shell damage. The 75 mm Vickers HV is an average gun at Tier 5, blending excellent penetration, good rate-of-fire, acceptable shell damage, and good accuracy. However, the gun depression is restricted to only 4 degrees, and this will significantly limit the number of viable positions the Churchill can fight from. As heavy tank generally fight peek-a-boo style, the Churchill's slow speed and pathetic alpha damage are not competitive in the slightest. The hull gun is non-functional, although risky shooting at since it is surrounded by 177mm plate. Armour is good. Paper values are a lie since the 177 mm plate is only correct for the half of the glacis around the hull-mounted gun. Due to its vertical plates, it will require proper angling to make the most out of it. The turret, however, is difficult to angle, as the short reload requires the player to keep aiming at the enemy in order to do damage. The stock turret has better armour than the upgraded one turret and is also smaller in size. However, it can mount only the 2-pdr gun and 3-inch Howitzer, which both are extremely weak for tier 5. Mobility is by far the Churchill I's greatest weakness. It is slow, and cannot react quickly to changes on the battlefield. It is not uncommon for battles to be effectively over before the Churchill can get to the front lines if one of the teams is significantly weaker than the other. The tank also handles like a boat, and cannot hope to keep up with circling enemies, although the fast turret helps somewhat. Unless the player is skilled, it is better to play Churchill 1 as 2nd line support tank rather than a first line pusher, considering the ease with which the Churchill 1 gets detracked, but the gun has good accuracy and penetration. The 75 mm Vickers HV is still quite capable against all but the heaviest Tier 7 tanks, and it is generally better to leverage its good accuracy and high rate-of-fire at longer ranges. The WS-19 MkII radio carries over from the Matilda and the Valentine. If you came from the Matilda, you can equip the OQF 3-inch Howitzer Mk. I, otherwise you will need to research it, so you can equip it while you research the tracks and turret/guns. You will need to research the tracks next because the 2nd turret + 6 pounder/75mm combination is too heavy for the original tracks. Research turret upgrade next, don't equip it unless you came from Valentine and already have the better guns (it is weaker than the original turret). If you came from the Matilda, research the better guns and equip them together with the 2nd turret. The Tank, Infantry, Mk IV (A22) was a heavy British infantry tank used in the Second World War, best known for its heavy armour, large longitudinal chassis with all-around tracks with multiple bogies, and its use as the basis of many specialist vehicles. It was one of the heaviest Allied tanks of the war. The origins of the design lay in the expectation that war in Europe might be fought under similar conditions to that of the First World War and the emphasized ability to cross difficult ground. The Churchill was rushed into production in order to build up British defenses against a possible German invasion and the first vehicles built had flaws that had to be overcome before the Churchill was accepted for wide use. After several Marks had been built a better-armoured version - the Mark VII - entered service. The Churchill was used by British and Commonwealth in North Africa, Italy, and North-West Europe. In addition, many were supplied to the USSR and used on the Eastern Front. There is some an ambiguity regarding whom the tank is named after. It may have been named after Winston Churchill, who was Prime Minister of the United Kingdom and Minister of Defense at the time and had been involved with the development of the tank as a weapon during the First World War. Alternatively, and fitting in with other British tank names, it may have been named after John Churchill, 1st Duke of Marlborough, an ancestor of Winston Churchill and the leader of the British Army in the War of the Spanish Succession . Winston himself reportedly thanked the manufacturers for naming it after his ancestor. However, the duality in the attribution may also have been intentional. Initially specified before the outbreak of the Second World War the (General Staff designation) A20 was to be the replacement for the Matilda II and Valentine infantry tanks. In accordance with British infantry tank doctrine and based on the expected needs of World War I-style trench warfare, the tank was required to be capable of navigating shell-cratered ground, demolishing infantry obstacles such as barbed wire, and attacking fixed enemy defenses; for these purposes, great speed and heavy armament were not required. The vehicle was specified initially to be armed with two QF 2 pounder guns each located in a side sponson, with a coaxial BESA machine gun. A third BESA and a smoke projector would be fitted in the front hull. The specification was revised to prefer a turret with 60 mm of armour to protect against ordinary shells from the German 37 mm gun. 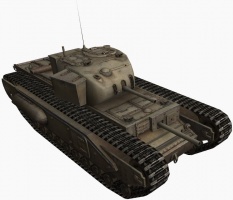 Outline drawings were produced based on using the A12 Matilda turret and the engine of the Covenanter tank. Detail design and construction of the A20 was given to the Belfast shipbuilders Harland and Wolff who completed four prototypes by June 1940. During the construction period the armament was reconsidered which including fitting either a 6 pounder or a French 75 mm gun in the forward hull. In the end, a 3-inch howitzer was chosen. The A20 designs were short-lived, however, as at roughly the same time the emergency evacuation of the British Expeditionary Force from Dunkirk occurred. At 43 tons, with a 300 hp flat-12 Meadows engine, the A20 had limited power compared to the 18 ton Covenanter. This was a less serious limitation than it might appear, owing to the British distinction between the high-speed cruiser tanks and the slow-speed infantry tanks. Vauxhall was approached to see if they could build the A20 and one example was sent to Vauxhall at Luton to see if they could provide an alternative engine. To this end, they developed a flat-12 petrol engine. For speed of production, this engine was based on a Bedford six-cylinder lorry engine, giving rise to its name of "Twin-Six". Although still a sidevalve engine, the engine was developed with high squish pistons, dual ignition and sodium-cooled exhaust valves in Stellite seats to give 350 bhp. The document then covered for each area of the tank affected, the fault, precautions to avoid the fault and what was being done to correct the problem. This hasty development doesn't come without cost, though, as there had been little in the way of testing and the Churchill was plagued with mechanical faults. Most apparent was that the Churchill's engine was underpowered and unreliable, and difficult to access for servicing. Another serious shortcoming was the tank's weak armament, the 2-pounder (40 mm) gun, which was improved by the addition of a 3-inch howitzer in the hull (the Mk IICS had the howitzer in the turret) to deliver an HE shell albeit not on a howitzer's usual high trajectory. These flaws contributed to the tank's poor performance in its first use in combat, the disastrous Dieppe Raid in August 1942. Production of a turret to carry the QF 6 pounder gun began in 1941 but problems with the plate used in an all-welded design led to an alternative cast turret also being produced. These formed the distinction between Mark III and Mark IV. 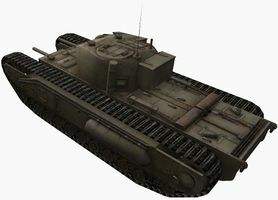 The poor performance of the Churchill nearly caused production to be ceased in favour of the upcoming Cromwell tank; it was saved by the successful use of the Mk III at the Second Battle of El Alamein in October 1942. 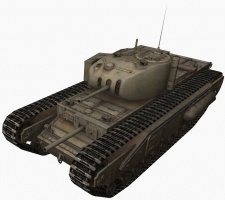 The second major improvement in the Churchill's design, the Mk VII saw first used in the Battle of Normandy in 1944. The Mk VII improved on the already heavy armour of the Churchill with a wider chassis and the 75 mm gun which had been introduced on the Mk VI. It was primarily this variant, the A22F, which served through the remainder of the war and was re-designated as A42 in 1945. The Churchill was notable for its versatility and was utilized in numerous specialist roles. The hull was made up of simple flat plates which were initially bolted together and were welded in later models. The hull was split into four compartments: the driver's position at the front, then the fighting compartment including the turret, the engine compartment, and the gearbox compartment. The suspension was fitted under the two large "panniers" on either side of the hull, the track running over the top. There were eleven bogies either side, each carrying two 10-inch wheels. Only nine of the bogies were taking the vehicle weight normally, the front coming into play when the vehicle nosed into the ground or against an obstacle, the rear acting in part as a track tensioner. Due to the number of wheels, the tank could survive losing several without much in the way of adverse effects as well as traversing steeper terrain obstacles. As the tracks ran around the panniers, escape hatches in the side could be incorporated into the design. These were retained throughout the revisions of the Churchill and were of particular use when the Churchill was adopted as the AVRE. The Bedford Vehicles engine was effectively two engines in horizontally opposed configuration ("flat twelve") on a common crankshaft. There were four Solex carburetors each on a separate manifold that fed three cylinders formed as a single cylinder head. The elements of the engine and ancillary components were laid out so they could be reached for maintenance through the engine deck covers. Air for the engine was drawn from the fighting compartment through air cleaners. Cooling air was drawn into the engine compartment through louvres on the sides, across the radiators and through the engine compartment by a fan driven by the clutch. This fan blew the air over the gearbox and out the rear of the hull. By opening a flap between the fighting compartment and the engine compartment this airflow could be used to remove fumes produced by firing the armament. The 1,296 cubic inch capacity engine was rated at 350 bhp at 2,000 rpm delivering 960 lb·ft (1,300 N·m) over an engine speed range from 800 to 1,600 rpm. The gearbox featured a regenerative steering system that was controlled by a tiller bar instead of the more commonplace brake levers or a steering wheel. The tiller was connected with servo assistance, hydraulically to the steering brakes. 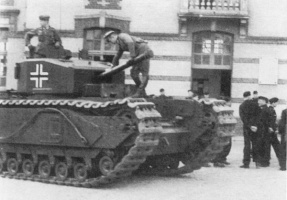 The Churchill was also the first tank to utilise the Merritt-Brown gearbox, which allowed the tank to be steered by changing the relative speeds of the two tracks; this effect became more pronounced with each lower gear, ultimately allowing the tank to perform a "neutral turn" when no gear was engaged where it could fully turn on its own axis. There were final reduction gears, of the planetary type, in the driving wheels. The first turrets were of cast construction and were rounded in shape, providing sufficient space to accommodate the relatively small 2 pounder gun. To fulfill its role as an infantry support vehicle the first models were equipped with a 3-inch howitzer in the hull in a layout very similar to the French Char B. This enabled the tank to deliver a useful high-explosive capability while retaining the antitank capabilities of the 2-pounder. However, like other multi-gun tanks, it was limited by a poor fire arc - the entire tank had to be turned to change the aim of the hull gun. The Mk II dispensed with the howitzer and replaced it with a bow machine gun and on the Mk III, the 2-pounder was replaced with the 6-pounder, significantly increasing the tank's anti-tank capabilities. The tank underwent field modification in North Africa with several Churchills being fitted with the 75 mm gun of destroyed M4 Shermans. These "NA75" variants were used in Italy. The use of the 75 mm, which was inferior as an anti-tank weapon to the 6-pounder but better as an all-around gun was soon made standard on successive versions. Churchills made use of the Vickers Tank Periscope MK.IV. In the Mark VII, the driver had two periscopes as well as a vision port in the hull front that could be opened. The hull gunner had a single periscope as well as the sighting telescope on the BESA mounting. In the turret, the gunner and loader each had single periscope and the commander had two fitted in his hatch cupola. 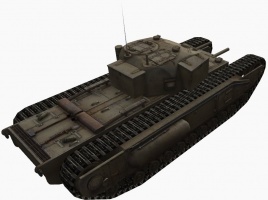 The armour on the Churchill, often considered its most important feature, was originally specified to a minimum of 16 millimetres (0.63 in) and a maximum of 102 millimetres (4.0 in); this was increased with the Mk VII to a range from 25 millimetres (0.98 in) to 152 millimetres (6.0 in). Though this armour was considerably thicker than its rivals (including the German Tiger I tank, but not the Tiger II) it was not sloped, reducing its effectiveness. Earlier models were given extra armour by the expedient of welding extra plates on. On the Mark VII, the hull front armour was made up of a lower angled piece of 5.5 in (140 mm), a nearly flat 2.25 in (57 mm) plate and a vertical 6-inch plate. The hull sides, were, for the most part, 3.75 in (95 mm). The rear was 2 in (51 mm) and the hull top 0.525 in (13.3 mm). The turret of the Mark VII was 6 in (150 mm) to the front and 3.75 in (95 mm) for the other sides. The turret roof was 0.79 (20 mm) thick. The plate was specified as IT 80, the cast sections as IT 90. 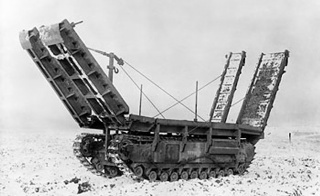 The A22F, also known as "Heavy Churchill" was a major revision of the design. The most significant part was the use of welding instead of riveted construction. Welding had been considered earlier for the Churchill but until its future was assured this was no more than testing techniques and hulls at the firing ranges. What welding reduced the overall weight (estimates were around 4%), the thicker armour of the A22F made up for. Welding also required fewer man-hours in construction. The hull doors changed from square to round which reduced stresses. A new turret went with the new hull. The sides, which included a flared base to protect the turret ring, were a single casting while the roof which did not need to be so thick was a plate fitted to the top. Since the engines on the Churchill were never upgraded, the tank became increasingly slower as additional armour and armament were equipped and weight increased; while the Mk I weighed 39,118 kg (40 long tons) and the Mk III weighed 39,626 kg, the Mk VII weighed 40,643 kg. This caused a reduction in the maximum speed of the tank from its original 26 kilometres per hour (16 mph) down to 20.5 kilometres per hour (12.7 mph). The engines also suffered from many mechanical problems. Another problem was the tank's relatively small turret that prevented the use of powerful weapons; definitive versions of the tank were armed with either the QF 6 pounder or the derivative QF 75 mm gun, both having reasonable powers against armoured and soft targets respectively but with a limited performance against the other. 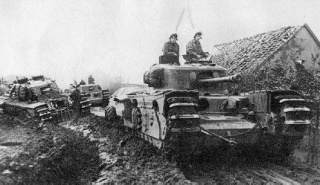 Although earlier Churchills could outgun many contemporary German medium tanks, like the Panzer IV with the short-barrel 75 mm gun and the Panzer III's 50 mm gun, with its 6 pounder, and the thick armour of all Churchill models could usually withstand several hits from any German anti-tank gun, in late war Germans had 75 mm high-velocity cannons as their main armament and increased protection, against which the Churchills' own guns often lacked sufficient armour penetration to fight back effectively. 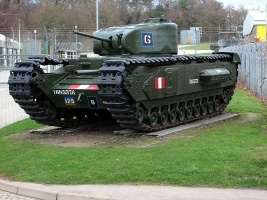 The Churchill had many variations, including many specialised modifications. The most significant change to the Churchill was that it was up-gunned from 2-pounder to 6-pounder and then 75 mm guns over the course of the war. By the war's end, the late model Churchill Mk VII had exceptional amounts of armour - considerably more than the German Tiger tank. However, the firepower weakness was never fully addressed. The Mark VII turret that was designed for the 75 mm gun was of composite construction - cast with top and bottom plates welded into position. It is important to note that, despite its weaknesses, the Churchill had a significant advantage that was apparent throughout its career. Due to its multiple bogie suspension, it could cross terrain obstacles that most other tanks of its era could not. This feat served well, especially during the fighting in Normandy particularly the capture of Hill 309 between the 30 and 31 July 1944 in operation Bluecoat conducted by VIII Corps. The 75 mm Vickers HV gun was developed only for the Cromwell. The Churchill Mk III turret was never mounted on the Churchill Mk I hull with the hull-mounted gun. The QF 75 mm gun was only mounted on the Churchill Mk VI and VII variants. The Royal Armoured Corps recognition mark (or flash) on Churchill tanks was painted red/white/red, not white/red/white. Overall dark green paint scheme is missing. Dark yellow for the North African Campaign is also missing. This page was last modified on 18 April 2019, at 09:05. This page has been accessed 366,068 times.